CAUTION: Installing filler brackets over empty card-slot openings is necessary to maintain FCC certification of the computer. 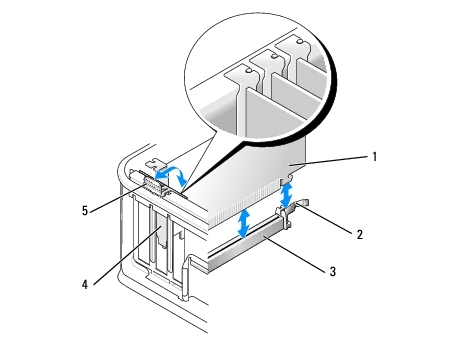 The brackets keep dust and dirt out of your computer and maintains the airflow that cools your computer. 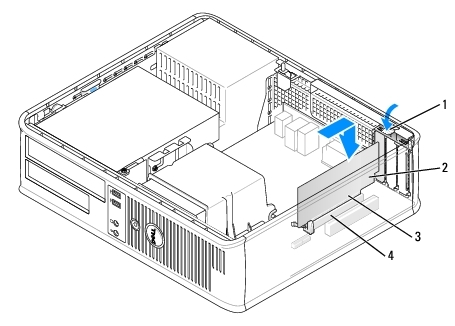 NOTE: Your Dell computer includes only PCI and PCI Express card connectors. ISA cards are not supported. If you are replacing a PCI card, remove the current driver for the card from the operating system. See the documentation that came with the card for information. Gently lift the release tab on the card-retention latch all the way up. 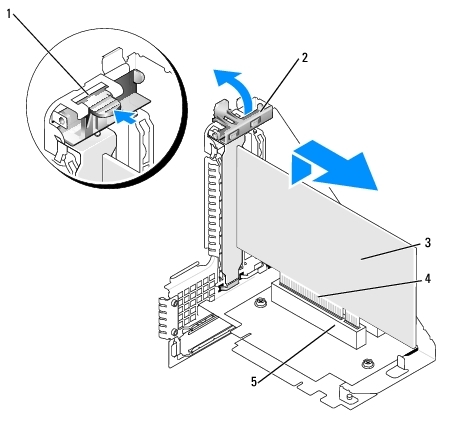 If you are installing a card in an empty card connector on the system board, remove the filler bracket to create a card-slot opening at the back of the computer. Then continue with step 6. If you are installing a card to replace one already installed in the computer, remove the installed card (see Removing a PCI Card). 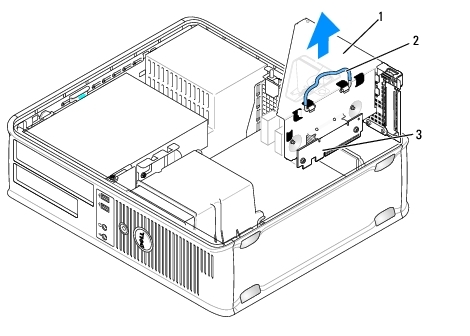 If you are installing a PCI Express x16 card, hold the securing-tab release lever away from the card connector as you insert the new card into the connector slot. Place the card in the connector and press down firmly. 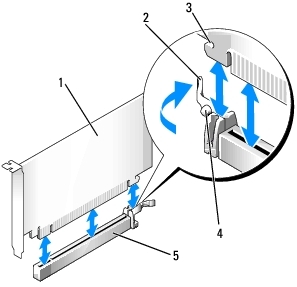 Using the following illustration as a guide, ensure that the card is fully seated in the slot. 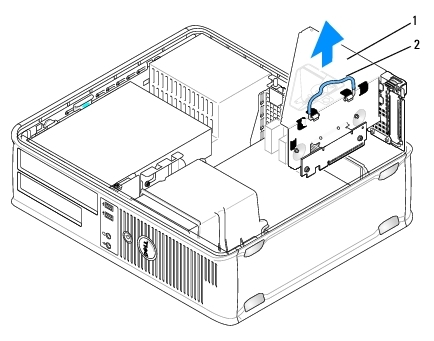 NOTE: If you are installing a PCI Express x16 card, ensure that the securing tab on the connector's release lever fits into the notch on the front end of the card. Gently rotate the release tab downward to move the card-retention latch into place to secure the cards. CAUTION: Do not route card cables over or behind the cards. Cables routed over the cards can prevent the computer cover from closing properly or cause damage to the equipment. Replace the computer cover (see Replacing the Computer Cover), reconnect the computer and devices to electrical outlets, and then turn them on. Enter system setup, select System Configuration® Miscellaneous Devices, and change the Audio setting to Disabled. (See Entering System Setup). Gently rotate lift the release tab on the card-retention latch. If you are replacing a PCI Express x16 card, remove the installed card by gently pulling the release lever away from the card until you release the securing tab from the dent in the card. Rotate the release tab downward to snap the card-retention latch into place. 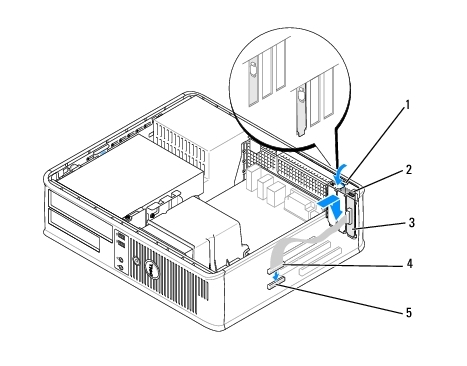 Check any cables connected to cards through the back panel openings. Disconnect any cables that will not reach the riser-card cage once they are removed from the computer. Gently pull on the handle and lift the riser-card cage up and away from the computer. Press in on the tab to raise the card-retention latch. Lower the card-retention latch and press it into place. 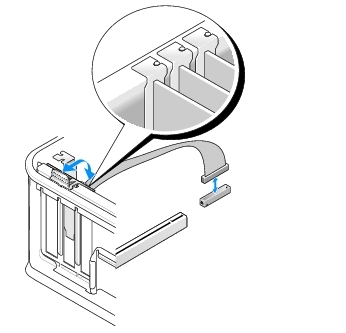 Align the tabs in the side of the riser-card cage with the slots on the side of the computer, and slide the riser-card cage down into place. Ensure that the riser cards are fully seated in the connectors on the system board. Enter system setup, select System Configuration® Miscellaneous Devices, and change the Audio setting to Enabled. (See Entering System Setup). Enter system setup, select System Configuration® Integrated NIC, and change the setting to Enabled. (See Entering System Setup). 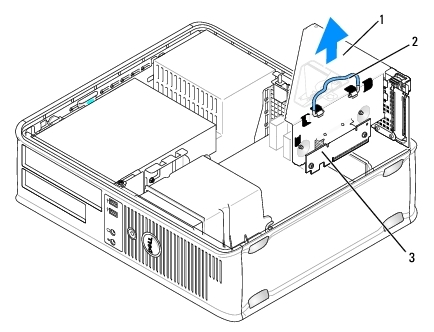 If applicable, remove the card installed in the SLOT2 connector on the system board. 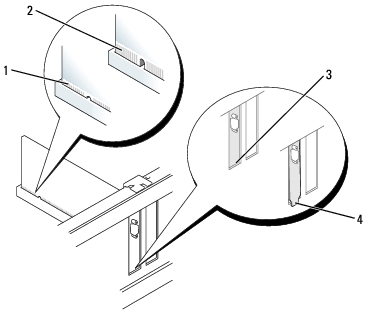 If you are installing a new card, remove the filler bracket to create an empty card-slot opening. If you are replacing a card that is already installed in the computer, remove the card. If necessary, disconnect any cables connected to the card. Grasp the card by its corners, and ease it out of its connector. Prepare the new card for installation. Press the release tab to raise the card-retention latch. Insert the card firmly into the card connector on the riser-card cage. Lower the card-retention latch and press it into place, securing the card(s) in the computer. Reconnect any cables that you removed in step 4. Enter system setup, select System Configuration® Integrated NIC, and change the setting to Disabled. (See Entering System Setup). Connect the adapter cable to the PS/2 serial port adapter connector (SERIAL2) on the system board (see System Board Components). Rotate the riser-card cage handle up and gently pull on the handle to lift the riser-card cage up and away from the computer. 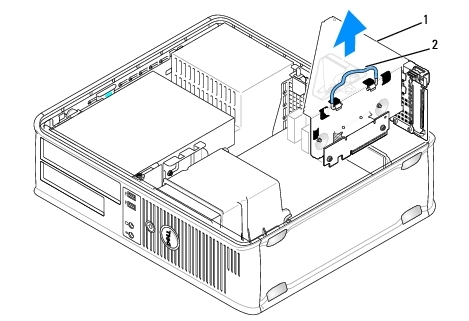 If you are installing a new PS/2 serial port adapter, remove the filler bracket to create an empty card-slot opening. 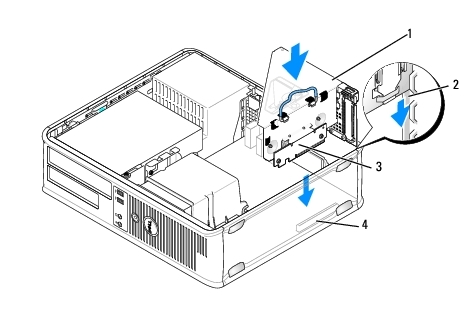 If you are replacing a PS/2 adapter that is already installed in the computer, remove the adapter. If necessary, disconnect any cables connected to the adapter. WARNING: To guard against electrical shock, be sure to unplug your computer from its electrical outlet before installing any cards or adapters. Ensure that the riser-card connectors are fully seated in the connectors on the system board. Rotate the riser-card cage handle to the down position. Install any drivers required for the PS/2 serial port adapter. Rotate the riser-card cage handle up and gently pull on the handle and lift the riser-card cage up and away from the computer. Grasp the PS/2 serial-port adapter bracket by its top corners, and ease it out of its connector. 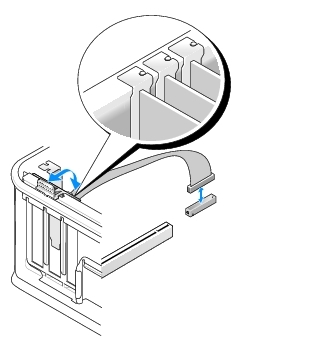 NOTE: Installing filler brackets over empty card-slot openings is necessary to maintain FCC certification of the computer. 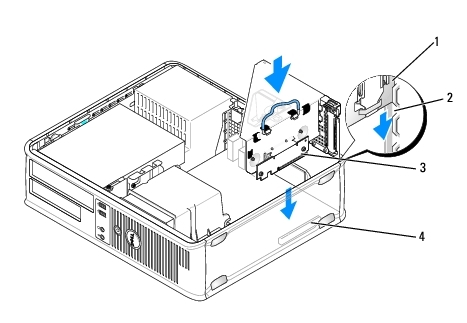 The brackets also keep dust and dirt out of your computer. Uninstall the adapter's driver. See the documentation that came with the adapter for instructions.